NETHERLANDS: National governments should adopt a sensible mix of technologically specific and neutral support schemes as renewable energies achieve higher penetration, manufacturers said at WindEurope's conference in Amsterdam. The OEMs welcomed the industry Committee of the European Parliament backing a binding target of at least 35% renewable energy for 2030, up from the previously agreed 27%. They also spoke in favour of EU support for measures such as requiring governments to give five years of visibility to investors on public support for renewable energy deployment, reinforcing an investment protection clause, and an improved framework for Guarantees of Origin and corporate renewable power purchase agreements (PPAs). Turmes argued that because individual nations play a greater role than the EU in energy generation projects, the onus for policies that encourage renewable deployment should fall on member states. José López-Tafall Bascuñana, director of regulatory affairs at Acciona, pointed out how technology-specific support schemes had helped technologies develop. "If you look at the past, if we had gone from strictly neutral support schemes, we would not have the got the wind that we have now, or the renewables that we need. It would be full of coal because that would have been the cheapest source of energy. "If we only look at the sector in terms of competitive policy, we would be neglecting our need to go forwards in investment and environmental terms and in terms of research and development. It goes against all that we have built so far." However, he recognised the benefits of technologically neutral tenders in creating competition. "Are we going to achieve lower prices and higher reliability [with technology-specific support schemes alone]? Most likely not. That is why we also need tech-neutral schemes." 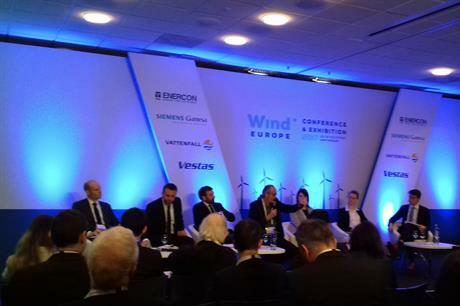 Katrin Düning, international governmental and political relations manager at Enercon, said the company was "not against competition", but believes the stability created by technology-specific schemes is crucial for manufacturers. "It is difficult if you have technologies mixed or neutral," she said. "We would like some visibility. If you have specific volumes then you will be more likely to invest in research and development (R&D). That can bring down the cost. "Maybe if you do not have that visibility, you will reduce your spending in R&D."